One of the most important things to consider when choosing your first (or primary) legal offshore sportsbook is what kinds of deposit methods they accept. Most of the top USA online sportsbook sites take a number of different funding methods in an effort to cater to the maximum number of US bettors, but different sites still have different banking options. As such, when choosing a book to join, you would do well to make sure you understand each one’s deposit options. The types of deposit methods boil down to a few basic categories. The first and most popular funding option is the use of major credit cards, debit cards, and prepaid cards. Second, there are various forms of wire transfers that players can use, from services like Western Union and MoneyGram to standard bank wires. Newer deposit methods for U.S. players include cryptocurrencies like Bitcoin and other altcoins, all of which are extremely fast and reliable. Finally, money orders and cashier’s checks are other solutions that some sportsbooks accept for the funding of your account. Below, we list some of the main U.S. deposit methods available across the best online sportsbook sites. Mastercard is another major credit card and is an accepted method of deposit at sports betting sites taking USA players. However, it is not as widely as accepted as VISA. Some sportsbooks that accept MasterCard will accept this form only after trust is established. You can typically deposit up to $5,000 with a Mastercard, and there may be a small deposit processing fee of up to 6%. American Express is the third and last of the major credit cards that can be accepted at online sportsbooks, though of the three, VISA and Mastercard are more widely accepted as a general rule. Limits for AmEx are lower than other credit cards, and there are higher fees. Expect to deposit no more than $2,500 and potentially pay a transaction fee of up to 10%. Though not as popular, American Express is still a viable funding method at many of the best sites for U.S. online sports betting. Some sites will not advertise that they accept American Express, but exceptions may be made for established players, so contact your sportsbook’s customer service representative to find out for sure. One of the newer funding methods for USA players to deposit into online betting sites is a digital currency called Bitcoin, and it's not affiliated with any country's economy. It has its own value and is gaining steam with some of the biggest online merchants as a primary payment method. It has a 100% success rate and is accepted by several of the most trusted bookmakers taking US residents. Aside from Bitcoin, bettors can also use cryptos like Ethereum, Litecoin, DASH, Bitcoin Cash, Cardano/ADA, Stellar Lumens, Ripple, and more for online sportsbook deposits. Bookmakers typically accept anywhere from $10 to $25,000 in crypto without any added fees (beyond the tiny transaction fees built into the blockchain technology powering these alternative payment methods). A wire transfer is a fast and efficient way to transfer money from a bank account into online sportsbooks that accept Western Union. With a wire transfer, there will be some moderate fees that are associated with this type of deposit method, but they are widely accepted at sports betting sites legal for US players. These are under the “person to person” category at online sportsbooks, and you can usually only deposit a couple of hundred dollars at a time. A MoneyGram transfer is a fast and convenient way to send a deposit from the payer to the cashier at the site. Similar to a Western Union transfer, a MoneyGram takes up to 30 minutes from the time the account holder sends the funds to the time it's received and deposited. Players should be mindful of any fees that come with transferring on the part of the sender, as most sportsbooks will not have any deposit fees on their end for transfers above a certain limit (i.e. $300). A prepaid card is another accepted method of funding a sportsbook account, and this is done in similar fashion to depositing with major credit cards. The time it takes for the money to get into your sportsbook account is about the same as that required for a standard credit/debit card transaction. If you opt to use a prepaid card or Visa gift card to fund your offshore sports betting account, please make sure that these are certified for international purchases. If they are not valid for international purchases, these cards will not work for funding your sportsbook bankroll. If you are not someone who wants to use a credit card, debit card, cryptocurrency, or a wire transfer, there are some online sportsbooks out there that support money orders or cashier's checks as methods of funding. Sportsbooks usually do not accept personal checks, but they do tend to accept money orders and cashier's checks. You can deposit up to $15,000 at most books via these methods, and some sites will even refund your express shipping fees. Right below this section, we’ve listed several online sportsbooks that accept USA players and which also have easy deposit methods (plus multiple sportsbook withdrawal methods which are equally as important). These are primarily the same betting sites that you will see on the rest of our pages, and that is because each is an all-around excellent pick for US sports gamblers. In a matter of a few minutes, you can create a new account and fund it using any of the deposit methods we covered in the section above. And if you stick with those deposit methods at our recommended sportsbooks, you’re guaranteed a safe online sports betting experience. Of all the top US online sportsbooks, Bovada is the most popular nationwide. This is ironic for a couple of reasons, as the site is the only one of the top-tier not to accept residents from all 50 states (DE, MD, NJ, NV residents cannot currently join), and it’s also got the fewest deposit options of any major betting service. However, the deposit banking options that Bovadauses are perfect for the vast majority of US players. At Bovada, you can sign up with VISA, Mastercard, American Express, Bitcoin, and Bitcoin Cash. For long-time, established customers, Bovada may accept wire transfers or checks, but these are not available to the general public. Mostly, Bovada wants its new members to transition to Bitcoin and Bitcoin Cash, as they offer a massive Welcome Bonus worth up to $5000 (promo code BVSBITCOIN50) when you deposit with either of these alternative currencies. BetOnline is among the leaders when it comes to betting line options, and they extend that variety to their sportsbook deposit options. BetOnline accepts VISA, Mastercard, Bitcoin, Ethereum, Litecoin, Bitcoin Cash, DASH, MoneyGram, Western Union, cashier’s checks, bank wires, and more. As is becoming a trend, BetOnline offers a number of bonus perks for first-time members, including a special Bitcoin/crypto deposit bonus that matches your first deposit by 100% for a total of $1000 in free plays. Just use promo code CRYPTO100 when making your first deposit via crypto, and you’ll be a high roller before you know it. SportsBetting is the market leader when it comes to deposit options. They accept everything that BetOnline does (credit, debit, cryptos, checks, money orders, bank wires, person-to-person, etc. ), including supporting American Express. No matter how much money you have – or how you choose to keep it – SportsBetting will work with you to get your sports betting account loaded up quickly and efficiently. New members at SportsBetting can get a 100% sportsbook welcome bonus when funding with Bitcoin et al., and this is worth up to $1000 in free plays. Simply enter the code 100CRYPTO when signing up and making your very first crypto deposit, and the bonus will be instantly credited to your account. 5Dimes is one of the oldest, most respected sportsbooks on the Internet, and they offer serious betting deposit options for serious players. At 5Dimes, you won’t find the sheer variety you might at certain other top books, but there are several options that are perfect for the dramatic majority of customers. These include VISA and Mastercard, cashier’s checks, money orders, and Bitcoin/crypto. 5Dimes is also one of the very few sportsbooks that offers book-to-book account transfers. 5Dimes does not have any specific rewards or bonuses tied to specific deposit methods, but you can get up to $520 in free-plays when you sign up, regardless of the banking method employed. Additionally, as always, all 5Dimes members are eligible for the site’s exclusive Reduced Juice program. 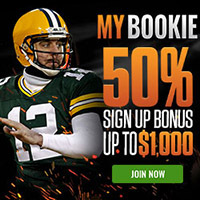 MyBookie is a USA online sportsbook that truly specializes in US sports. In fact, they cover all the major American pastimes (NFL, NCAA, NBA, MLB, NHL, MMA) arguably better than any book, at the expense of not operating books on international sports that don’t have as big a following among US customers. MyBookie accepts several funding methods, making it easy for Americans to sign up and get a few dollars into their accounts. These include VISA, Mastercard, cashier’s checks, wire transfers (person-to-person services), and Bitcoin. MyBookie doesn’t have banking-specific bonuses at this time, but their bonus selection changes frequently as different sports seasons come and go, so check back often to find out exactly what kind of new bonuses the site has in store for you.